Quakehold! 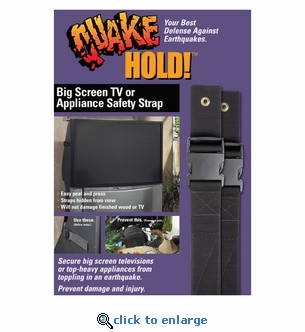 earthquake safety straps will secure top-heavy items such as big screen TVs, refrigerators, china cabinets, bookshelves and more to prevent toppling in an earthquake. Easy to install. Peel and press one end to the appliance, screw the other end into the wall stud. The extra wide and long adjustable nylon straps are strong and hidden from view. Straps secure to wall stud. No holes or damage to furniture. Peel and press one end to the appliance, screw the other end into the wall stud. Included hardware for securing 1 large appliance up to 6 ft. x 6 ft. and 500 lb.